Artists and creative professionals would like to enhance the functionality of iPad and this can be best achieved through a pressure sensitive stylus such as the Yufu Stylus. There are two pressure sensors on the YuFu stylus where users will get great grip. One pressure sensor is located at the tip and another sensor is located at the grip which makes it have a great control. Yufu Stylus has a 2mm tip and offers highest level of precision as well as accuracy. The stylus tip is well protected by a cap and the switch is protected with a cover so that it doesn’t get switched on accidentally. The Yufu Stylus is unique and easily be loved by artists and professionals. In fact, you cannot match the performance of Yufu Stylus with any other compatible stylus available in the market. The unit has tilt sensors which facilitate calligraphy and get the brush weight. The flawless palm rejection is achieved through the gyro, compass and accelerometer. 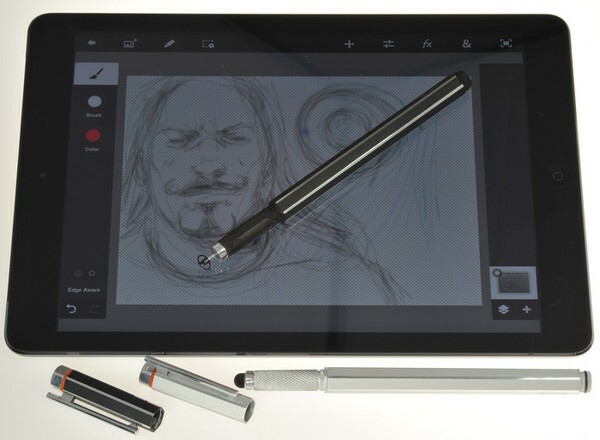 It is not only for artists’ sake that the stylus was designed for but also to meet the needs of other users. Thus, it is possible to accomplish digital writing and drawing in an effortless manner by using it. Yufu Stylus is available in two different models, the Yufu Pro which is meant for serious artists, Yufu Focus for advanced note taking and sketching jobs. The Yufu Stylus is the world’s best ultrasensitive pressure stylus which has sensors that can detect the palm rejection as well as pen angle. The design of Yufu Stylus is similar to the mechanical pencil with the stylus having the finest tip. The body of the stylus is only 1mm thicker than the normal wooden pencil which would make the user feel using a normal pencil. The stylus is filled with electronic circuits and it has features that can deal with the current generation capacitance screens. The stylus operates on AAA battery which can last for few weeks but if used heavily, the battery can die out soon. All the requirements of artists and other power users are fulfilled through the Yufu Stylus innovation. If you’re interested in procuring one, the device comes in a protective case which includes spare tips, batteries. For the YuFu Pro, it comes with additional features such as erasing the drawing by simply shaking it. Yufu Focus on the other hand overs 64 levels of pressure sensitivity and comes with full metal construction so that it can last for a lifetime (maybe). I too placed an order September 2015, and have not heard from them at all. Just disappeared!! I waited until now, thinking they are still in production and have emailed them twice, but no response. The credit card company cannot even give me back the money as its been too long since the charge!!!! Wonder how they were able to get so much press coverage. I placed my trust on them solely based on the coverage they received as that made them legit. Very upset. I order the Yufu-Pro stylus on July 2014 and after many excuses from Hex3 I cancelled my order on January 2015. After October 2014 they went dark with no updates, no excuses and they just disappeared from the face of the earth. They lost the trust from many people included myself. That is no a way to run a business.